When it comes to skincare I tend to stick to a certain routine when I know it works. 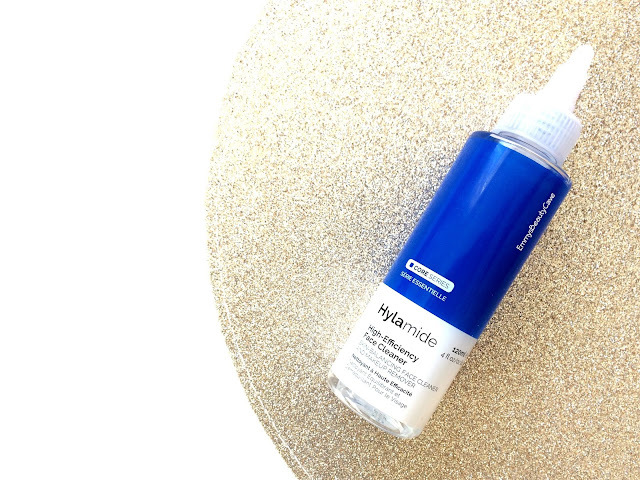 Im not one to keep testing out products when I find the products I have work well but something about the Hylamide High Efficiency Face Cleaner had me intrigued. The fact the product claims to be a skin balancing face cleaner and a makeup remover surprised me. I used to take my makeup off using the Garnier Micellar Water but this well and truly blows that out of the water. The Hylamide Face Cleaner claims to remove all traces of makeup, purify pores and provide hydration to the skin. When I opened the package it had me even more intrigued. The bottle came with a screw on lid which you take off and then screw on the pointed tip which lifts up to unlock and down to lock. The packaging is simple and to the point just how I like it. I tried this with a full face of makeup which for me includes primer, foundation, concealer, powder, bronzer, blush and highlighter... alot of makeup to put this product to the test. I poured some onto a cotton pad and began slowly removing my makeup. I was extremely shocked at how the liquid felt, it was nothing like anything I have tried before. It felt more like a lightweight oil. It glided across my skin effortlessly and it took me two cotton pads to remove the whole of makeup. When I looked in the mirror I couldn't see a trace of makeup but to be sure I decided to put some water onto a cotton pad and go all over my face. To my shock there wasn't one single smear of makeup on the cotton pad. The Hylamide Face Cleaner had removed every ounce of makeup. Even when I use the Garnier Micellar Water I still have small traces of makeup left. The second thing that shocked me was how my skin felt afterwards, it felt as if I had massaged in an oil but it didn't look or feel oily. My skin felt baby smooth and looked damn good! Usually when I have tried facial oils they make my skin more oily and don't work. The Hylamide Face Cleaner includes ingridients of Mediterranean Crambe and East Asian Kanuga Oils. The formula is incredible, I find it fascinating how the cleanser/makeup remover removes all of my makeup whilst cleaning my pores and making my skin look the best it ever has. For someone with oily skin this product works amazingly well. After use it feels incredibly smooth and leaves my skin hydrated. I also have extremely sensitive skin and find alot of skincare products irritate my skin especially on my cheeks. This didn't irritate my skin whatsoever which is a massive bonus. I will no longer be using the Micellar water as this product has stolen my heart. A product that does more than one job makes me happy, very happy. You can buy the Hylamide High Efficiency Face Cleaner (120ml) from Boots for £17.